What would you say about a band that in their first six years of existence sold more than 12.5 million digital singles and over 10 million albums in the United States alone? You’d probably tell me those are stats for Taylor Swift or some other major pop music artist. Well in today’s case, not only would you be wrong – but it’s an artist that unless you’re into country music, you may not have even heard of. Charles Kelley moved to Nashville in mid-2005 from Winston-Salem, North Carolina. He’d been working construction with his brother to make ends meet. He convinced an old buddy, Dave Haywood, to do the same from Georgia in 2006 so they could write music together. Shortly after, Hillary Scott connected with Kelley on Myspace, and they met at a Nashville music club to talk shop. Kelley invited Scott to join the new group, focusing on a modern country sound. While the group was doing local touring, they were photographing antebellum architectural style buildings—a style that describes large plantation homes in the American south. The group learned about the Antebellum Era, which commonly refers to the period before the Civil War. They decided that was a great band name and Lady Antebellum was born. While their commercial debut was released in 2008 with solid commercial success, today we’re listening to their sophomore effort “Need You Now.” This follow-up came out in January of 2010, debuting at number one on the Billboard 200 with nearly half a million sold in the first week. As of today, it’s sold over six million copies worldwide. Backed by the eponymous lead single, the album began to generate pre-release buzz in August of 2009 with some great radio play and reaction. After the trio’s performance at the CMA Awards and the 52nd Grammy Awards, there was a surge in singles sales for the track, and the anticipation for “Need You Now” was huge. While the music critics were mixed on whether it contained as much quality as their first record, it didn’t stop the sales or Capitol Records from signing them to another five album deal. The band was well on their way. It seems there’s sort of a love/hate battle with country music out there. Folks I know either listen to it and it’s their favorite genre, or they can’t stand it – very few in-between fans. While certainly it’s not my go-to type of music during my work day, I can groove to it from time to time. Especially something like this—it’s not your grandfather’s country western. It’s modern-day country pop that has been really hot for the last half decade plus. I honestly can’t compare it to other bands to determine if they’re doing it better than anyone else, but I know this: it’s not a bad listen. Vocally it’s outstanding, and given it’s country with a beat and some up-tempo, it’s different—and I like that. 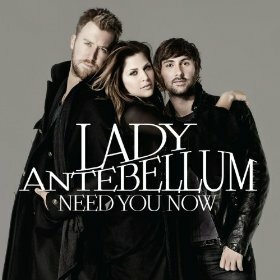 Contribute to the band’s already big-time success by picking “Need You Now” up today. I know there’s a ton of country fans out there, so throw this on in the pickup today or while you’re on your tractor–it’s worth the fiver.